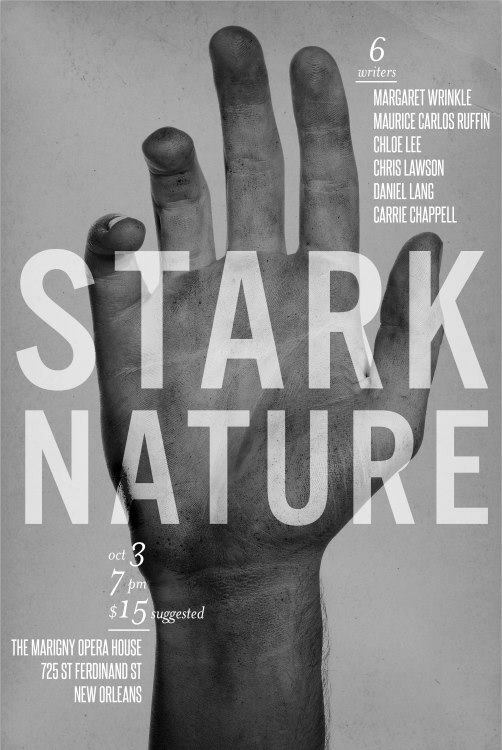 Peauxdunquian Maurice Carlos Ruffin will join a stellar line-up of writers at the Stark Nature reading on October 3rd. Maurice joins extraordinary poet Carrie Chappell, as well as Margaret Wrinkle, Chloe Lee, Chris Lawson, and Daniel Lang. They’ll be at the Marigny Opera House, 725 St. Ferdinand Street, NOLA, beginning at 7 p.m. A $15 fee is the suggested cover. This entry was posted in Friends of Peauxdunque, New Orleans Lit Events, Peauxdunquians in the World and tagged Carrie Chappell, Chloe Lee, Chris Lawson, Daniel Lang, Margaret Wrinkle, Marigny Opera House, Maurice Carlos Ruffin, Stark Nature, UNO by swampytad. Bookmark the permalink.